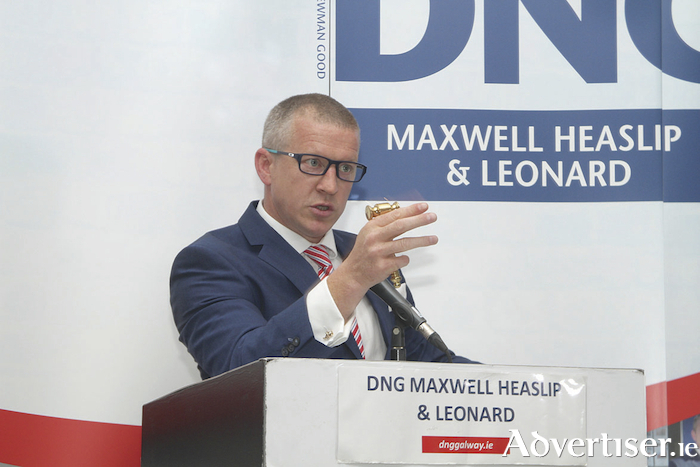 With summer almost here, the auction team in DNG Maxwell Heaslip & Leonard are busy putting together the final touches to the first of their summer 2019 auctions. May 9 will see a number of mixed residential units go to the auction floor with exceptional value across the board. A wonderful riverside apartment located on Dominick Street in Galway city centre. Directly adjacent to all amenities on offer, this location along with the area known as the Westend has evolved in recent years to form an eclectic mixture of food, entertainment, and cultural establishments. The apartment extends to approximately 60sq m and comprises a spacious open plan living/dining/kitchen with stunning views of the passing canal, two bedrooms, and a bathroom. This courtyard development is beside the river, away from the bustle of the street yet a short walk from everything. Rental values in this area are excellent. AMV: €195,000. On view Wednesday and Saturday 2pm to 3pm. A spacious four bed detached house comprising c120sq m of living space. Located in the heart of Tirellan Heights with all amenities on the doorstep to include, Tirellan NS, a crèche, a city bus service, Menlo Park Hotel, and Terryland SC. Additionally it is only a 20 minute walk to the city centre and NUIG and within easy access of many major employers on the east side of the city. It comprises an entrance hall, living room, kitchen/dining room, bathroom, four bedrooms, and a garage. While in need of modernisation it has the benefit of large front and rear gardens and ample parking. An ideal opportunity for an owner occupier seeking a spacious detached residence within walking distance of the city centre. AMV: €250,000. On view Wednesday and Saturday 12.30pm to 1.30pm. A super opportunity to acquire a top quality, two bedroom duplex apartment located within 200m of Gort town centre and all amenities. Extending to approximately 93sq m of living space, the accommodation is spread over two floors and includes an open plan living/dining room with a spacious fully fitted kitchen, two bedrooms, and a fully tiled en suite and main bathroom. Additionally, it benefits from a communal patio/courtyard, a private balcony off the living area, and ample communal parking. Being just a minute to Gort Square and with nearby access to the M18 motorway, makes this an attractive location for either an owner occupier or a savvy investor. An outstanding three bedroom investment property in Glasan Village on the Ballybane Road on the eastern side of Galway city, comprising c90sq m of living space and located directly opposite the GMIT. The property offers a substantial rental income during the student year with exceptional yields. Part of a fully managed development with on-site security and amenities, these units are ideal for those who seek a low maintenance rental property with a great return. AMV: €130,000. Viewing by appointment. A well presented two bedroom apartment in a modern development on the eastern outskirts of Galway city. Comprising approximatley 70sq m of living space, this bright and spacious top floor unit is fully fitted out and ready for immediate occupation. Located on the second floor, with its own entrance, the apartment has the benefit of a private rooftop balcony with wonderful views and is adjacent to a playground, with communal parking to the front of the property. AMV: €80,000. On view Wednesday and Saturday 11am to 12 noon. A two bedroom semidetached property located in the village of Loughlynn , approximately 10km from Castlerea in Co Roscommon. Comprising c110sq m of living space, it requires full renovation and modernisation. Within walking distance of all local amenities and the village centre. AMV: €45,000. Viewing by appointment. Joint agent DNG Cregg O’Callaghan (090 ) 666 5100. An excellent opportunity to acquire a three bedroom detached bungalow in the townland of Stralongford, in County Leitrim, approximately 12km from Drumshanbo. Comprising c140sq m, the property is in need of considerable modernisation and upgrading. Ideal opportunity for a first-time buyer. AMV: €67,000. Viewing by appointment. DNG Cregg O’Callaghan (090 ) 666 5100. The auction will take place in The Galmont Hotel, Lough Atalia, Galway, on Thursday May 9 at 3pm. Full particulars on any of the properties are available by contacting any of the auction team in DNG Maxwell Heaslip & Leonard at 091 565261.